This image contains an embedded watermark to protect against digital theft. This watermark will not be present in your print. MISCHIEVOUS TOM CAT is a colorful, stylized original colored pencil drawing of a cat face in my signature whimsical cartoon style. It is set against a background of soft hash marks in charcoal tones. 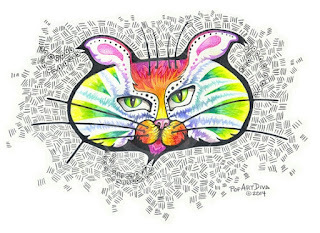 It's a contemporary illustration of a cat's head in rainbow colors. SPECIFICATIONS This is an 8-1/2" x 11" print of my original colored pencil drawing. A border is provided for matting and or framing purposes. I use archival-quality inks for vibrant color and detail printed on heavyweight glossy photo paper. Your print will come to you protected by a plastic sleeve in a rigid mailer for safe transport and shipped via First Class mail. There are no shipping charges for orders shipped within the United States. Image © 2014 by PopArtDiva Enterprises. All rights are reserved. Sales of artwork prints or originals does not transfer copyrights. Full copyright is retained by PopArtDiva Enterprises. The colors may appear slightly different than what you see here on your monitor. Images viewed online can be affected by operating system, monitor and screen settings as well as other factors. Please pick your purchases carefully. These original works of art are truly my heart and soul, done for love and not money - returns will hurt my feelings but I am always willing to work with you on an exchange. I do not give refunds except in the case of shipping loss or damage. I'm sorry but I no longer accept commissions or special orders original works of art. SIAMESE CATS WITH A POINT is my take on different versions of Siamese kitties but done as cat masks with fun ribbons flowing along side all those kitten whiskers. This piece is done in the soft tones of creams, browns, tans and warm greys and features all the point coloration typical of this lovely Oriental cat breed. Three Siamese cat masks float against a celestial background of soft warm tones with a few planets, stars and a shooting comet. This is an 8-1/2" x 11" print of my original colored pencil drawing with an image size of 7-1/2" x 10" allowing for a border for matting and or framing purposes. I use archival-quality inks for vibrant color and detail printed on heavyweight glossy photo paper. 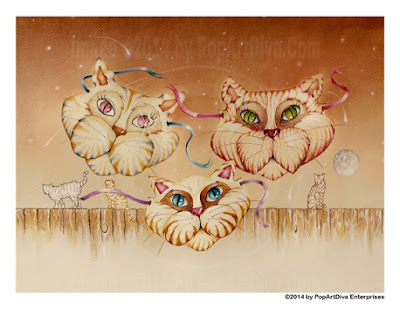 TABBY ROAD CATS Art Print features three fun tabby cat masks in warm tones of browns, oranges and soft greys in the foreground with three similar tabby kitties hanging out on a fence against a background of a warm sepia full moon evening. 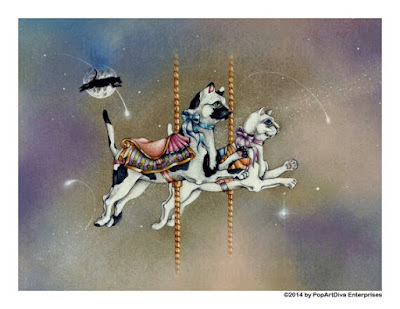 KITTY CAROUSEL CATS is full of feline fun as two carousel cats jump in tandem with the black Cat Who Jumped Over The Moon in the background. 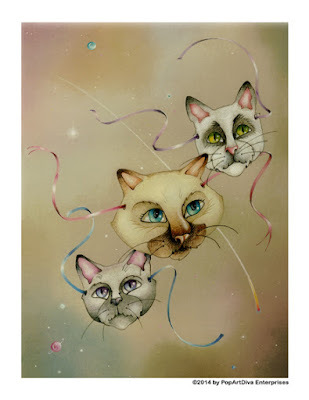 Done in soft pastel colors against a whirling background of dancing comets, shining stars and cosmic fairy dust, this is a perfect gift for any cat lover. The original was created in Prismacolor colored pencils and pastels. Inspired by my fascination and obsession with all things carousel and my love for all things feline aka kitten. 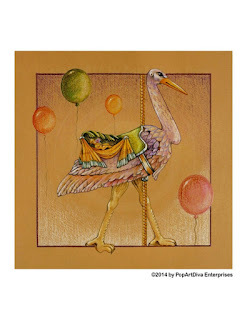 CAROUSEL STORK is a delightful rendering of a stork carousel carrying a baby nestled in a manger of drapery and leaves. Done in soft peaches, pinks, lavenders and accented with moss greens and a touch of turquoise, it is set against a warm toned background with floating balloons. Perfect as a baby or baby shower gift. The original was created in Prismacolor colored pencils and pastels. 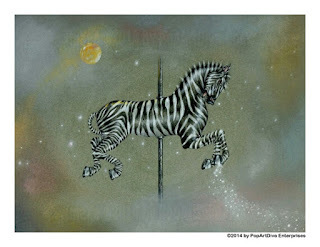 Inspired by my fascination and obsession with all things carousel. I've been all over the world and have tried to ride, or at least view, the famous carousels that still enthrall children of all ages - including me. This is an 8-1/2" x 11" print of my original colored pencil drawing with an image size of 7-1/2" x 7-1/2" allowing for a border for matting and or framing purposes. GLADIATOR CAROUSEL HORSES is a trio of prancing ponies decorated with carvings that reminded me of Roman gladiators. These three are covered in a rainbow of colors and are paired with floating balloons against a light blue background with a graduated dark blue "night" effect. 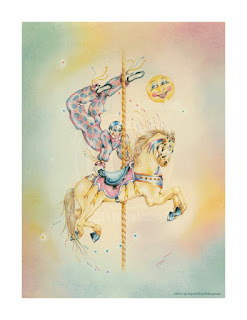 JESTER RIDES A CAROUSEL HORSE Art Print. 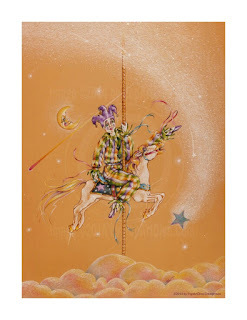 Dreams ride on a cloud in this whimsical and magical image of a satin bedecked jester style clown as he and his steed gallop around the heavens accompanied by a playful falling star, a visiting comet and the man in the moon. Created in peach tones with accents of purples, greens and blues. 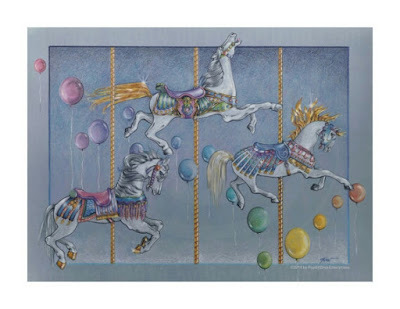 Inspired by my love of the Cirque du Soleil and the mysterious, elegant versions of European clowns, the Pierrots of Italy and France, the Jesters of the Middle Ages and my Carousel Horse hobby. This agile little Pierrot* Clown is part of the act doing a handstand on a prancing carousel pony. With matching pink and turquoise costumes, they dance happily against a misty pastel background of soft yellows, pinks and blues with a man in the moon looking on. Inspired by my love of the Cirque du Soleil and the mysterious, elegant versions of European clowns, the Pierrots of Italy and France. * Pierrot: (definition via Wikipedia) A stock character of pantomime and Commedia dell'Arte whose origins are in the late seventeenth-century Italian troupe of players performing in Paris and known as the Comédie-Italienne. WILD CAROUSEL ZEBRA was done in black and whites, of course, but there is soft color in the misty grey background featuring a shining yellow moon, stars and a dusting of stars flowing from the zebra's front hooves. The original was created in Prismacolor colored pencils and pastels. OLD WEST CAROUSEL HORSE is a Western themed carousel with an eagle head on the saddle and a Native American dancing on the side surrounded by drapery. 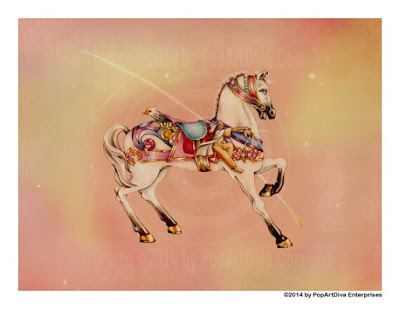 The colors of the horse are light blues, pinks and purples and the horse is set against a peachy pink background of comets and stars.